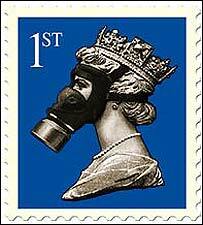 An art gallery has taken down three images of the Queen wearing a gas mask after a row with the Royal Mail. Artrepublic, in Brighton, had been showing the pictures, representing first, second and third class stamps, since May. The artworks were created by former pop star James Cauty, who was in the group KLF, and were a reflection of his stance on the war with Iraq. The Royal Mail had complained about the prints because it said they were a breach of its copyright. The gallery, in the North Lanes, took the pictures down on Friday. A spokesman for the gallery said: "It is true the images have been removed. "We are still in legal discussions with the Royal Mail. "We won't be able to issue any more information until that has been resolved."